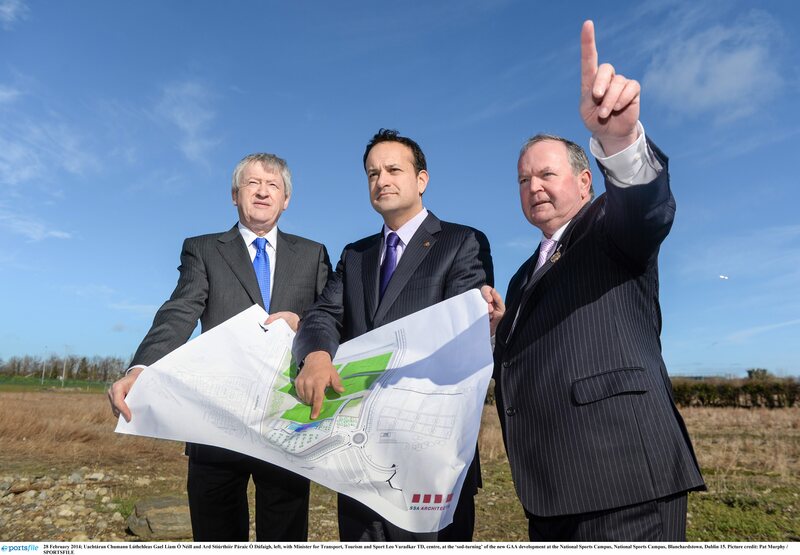 Development work at the GAA’s new facility at the National Sports Campus in Blanchardstown is set to commence and this milestone was marked today with the turning of the first sod at the site. Uachtarán Chumann Lúthchleas Gael Liam Ó Néill and Ard Stiúrthóir Páraic Ó Dúfaigh were joined at the facility by the Minster for Sport, Tourism and Transport and Sport Leo Varadkar TD and Seán Benton, Chair of the NSCDA. The project is to provide a centre of excellence for the GAA on a national scale at the National Sports Campus, Blanchardstown, Dublin 15. This involves the provision of a total of five pitches, four full size floodlit, including a synthetic pitch and a smaller training pitch. The pitches, will be constructed by Prunty and will be serviced by a new pavilion building designed by SSA Architects that accommodates ten changing rooms with associated physio, referees, meeting rooms, dining facility and reception area. In addition there is provision for a covered seated spectator area for approx 400 persons which is fully accessible. Adequate car parking will form part of the works. The building will make use of the latest sustainable energy options to reduce the running costs on a life cycle basis. Adjacent to the pavilion building, there will be a state of the art hurling wall. Work on the site will commence in the next fortnight and it is expected that the development will last 18 months. In total the GAA will invest €9m in the facility.